It's Friday and we made it through another week of planning your big day so I think we deserve some fun! And today I have a fun wedding favor to share with you. 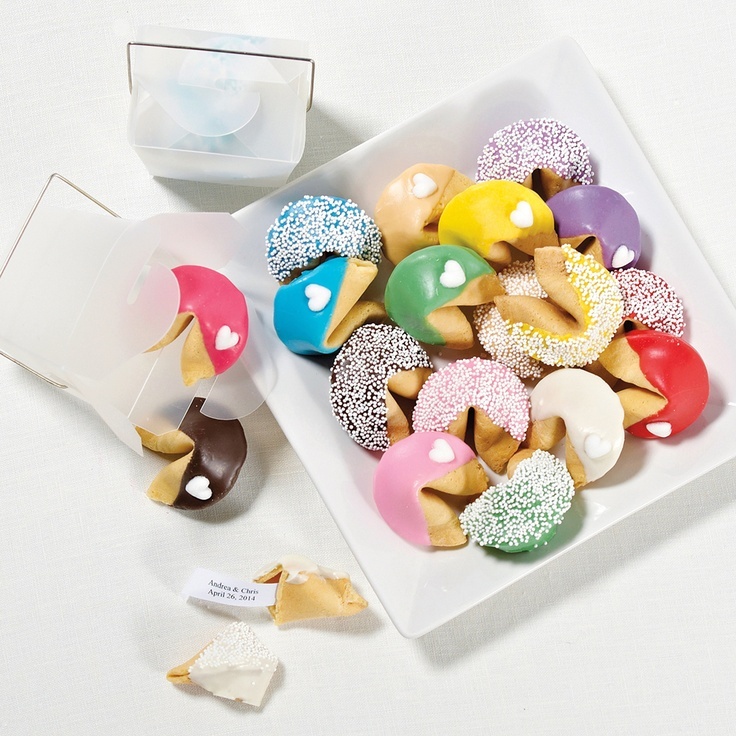 Take a peek at these adorable personalized fortune cookies. They really are just too darn cute. Now, we've talked about sending your guests home with cookies as favors before but we haven't showcased anything as unique as fortune cookies. What I love about these little cuties is that the fortune inside is your very own custom fortune. So you could add your wedding date with your names, or maybe a quote about love. And, if that's not amazing enough, the cookies can be dipped in any of the 10 different colors of white chocolate, so you can coordinate them with your wedding colors. Or pick a color that will accent your color palette. And, the cookies can be decorated with white sprinkles (very festive) or a tiny white heart. Each cookie is individually wrapped, so you can box them up in pairs for take home or maybe you'll want to put a bowl of cookies at each table. The possibilities are endless! We found these perfect personalized fortune cookies here.